On April 12 &13, Centre member Professor Barbara Brookes attended a workshop at Harvard University entitled ‘Postcolonial Tensions: Science, History and Indigenous Knowledges’ where the volume Pacific Futures: Past and Present (University of Hawaii Press, 2018) was officially launched by Professor Philip Deloria. The book resulted from a symposium held at the Hocken Library in June 2014 jointly sponsored by CRoCC and Professor Warwick Anderson’s Australian Research Council Laureate Fellowship program on ‘southern racial conceptions’. Professor Anderson, currently Gough Whitlam and Malcolm Fraser Chair of Australian Studies (2018-19) at Harvard University, co-convened the workshop with Professor Gabriela Soto Laveaga in the History of Science Department. 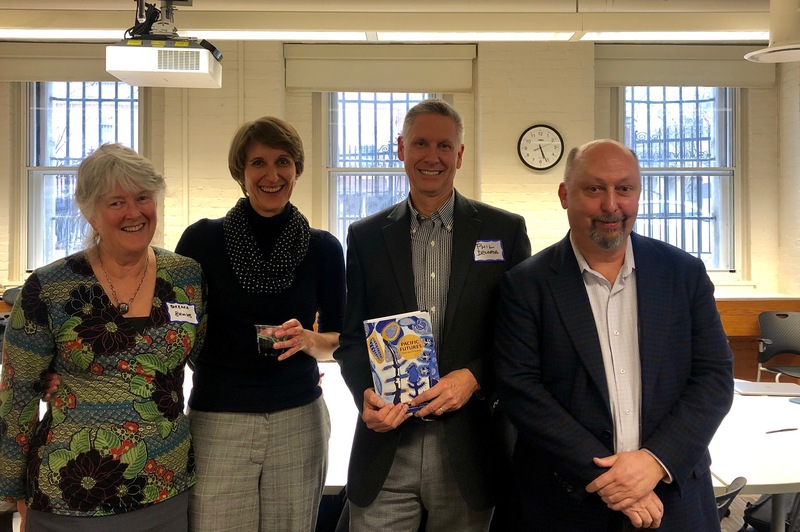 The three co-editors, Warwick Anderson, Miranda Johnson and Barbara Brookes, were delighted by Professor Deloria’s words about past futures and a celebratory toast was made to the success of the book. The Centre congratulates Barbara and her co-editors on the launch of this fine volume of essays. Barbara Brookes, Miranda Johnson, Philip Deloria and Warwick Anderson. If you are looking to participate in a New Zealand history conference this year then you are spoiled for choice with the New Zealand Historical Association’s biennial conference taking place later his year, as well as an event on the theme of Encounters and Exchanges aligned with the Tuia 250 commemoration programme. There’s also the 1869 conference and heritage festival in Dunedin and the annual New Historians conference. You’ve got plenty of time to think about a possible contribution. The NZHA Conference (27-30 November) has extended its call for papers to Friday 26 April (read more here). 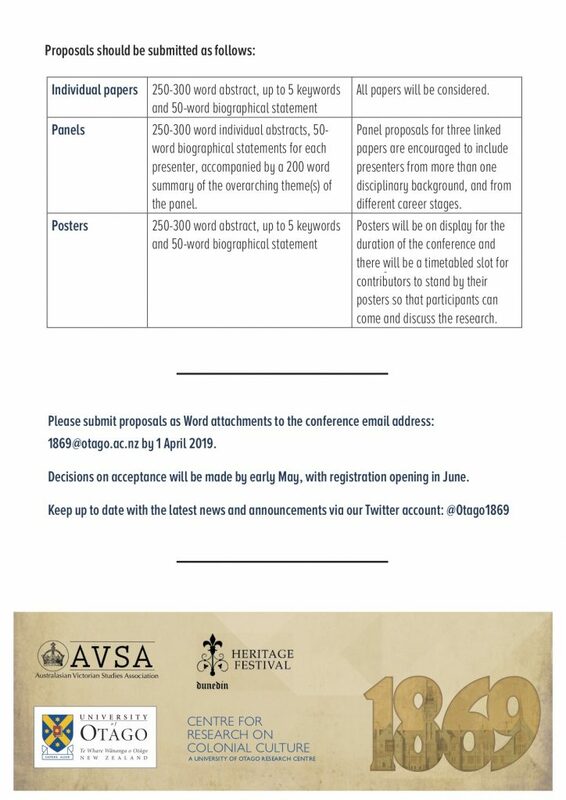 The 1869 Conference (25-28 September) call for papers has also been extended, to Monday 29th April (find out more here). For information on Encounters and Exchanges (1-3 December), check out their website. You have until May 8th to submit an abstract for that event. Postgraduates in New Zealand history programme should definitely consider attending the New Historians Conference (1-2 July, Wellington). It’s a great opportunity to network and build connections with other postgraduates, and to engage in the latest cutting-edge research. 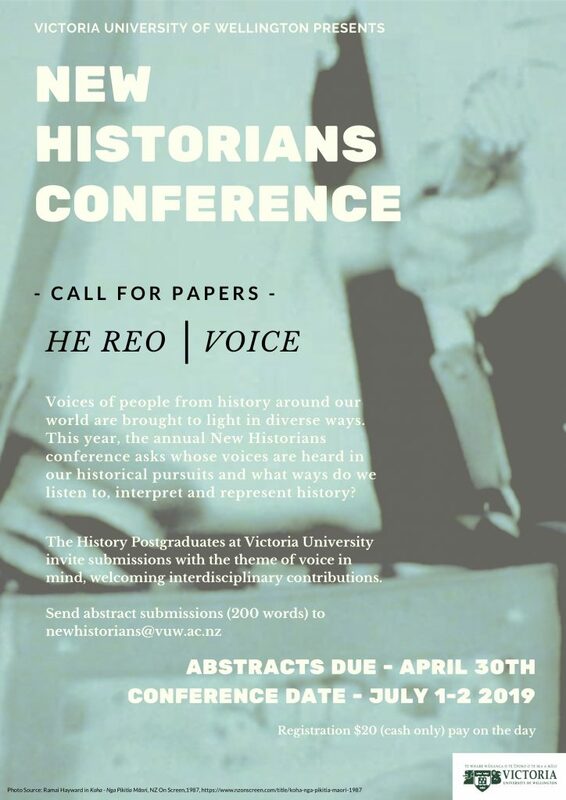 This year the theme is He Reo: Voice and abstracts are due by 30 April. Our Centre is supporting this forthcoming conference linked to the Tuia 250 commemoration activities taking place across the country this year. Please consider submitting an abstract. Submission deadline is 8 May. The University of Otago and the Tōtaranui 250 Trust announce a conference to take place in Blenheim, New Zealand from 1-3 December 2019 that will explore the global history of science, technology, medicine, and mātauranga (indigenous knowledge). The conference will be part of a sequence of national events in New Zealand titled Tuia – Encounters 250 Commemoration. These mark the 250th anniversary of James Cook’s first Pacific voyage and the first onshore meetings between Europeans and Māori. The conference is especially interested in analysing the implications for the global history of science, technology, medicine, and indigenous knowledge. The two major themes central to the Tuia – Encounters 250 Commemoration, ‘dual heritage-shared future’ and the importance of voyaging, pose a range of questions about knowledge, how it is generated, how it is communicated and translated, and how it is entangled with power. The emphasis on the important role of voyaging is consistent with a recent emphasis in the academic field of the history of science on ‘knowledge in transit’ or how science, technology, and indigenous knowledge – involving people, instruments, tools, communications, values, and epistemology – travel from one region to another and are transformed, reworked or contested. We welcome papers or panels that explore these kinds of questions, either within the specific contexts of the southern Pacific in the 1760s and 1770s, or in any other context where encounters and exchanges were integral to knowledge making. Building on the ‘dual heritage-shared future’ theme of the Tuia – Encounters 250 Commemoration, conference participants will explore recent efforts to analyse reciprocal relationships, the places where exchanges, negotiations, trade, and transactions have taken place, and the important role of mediators or go-betweens in the history of science, technology and indigenous knowledge. Participants will be encouraged to discuss the value of models for interactions that emphasise such concepts as ‘cultural borderlands’, ‘contact zones’, and ‘trading zones’. The conference will be especially interested in exploring the complex role of indigenous people in the history of science. Recent scholarship has emphasised that local people in all parts of the world not only gathered information but also helped categorize and conceptualize the information. Distinctions between amateurs and professionals as well as producers and users are no longer sharply conceived. As a contribution to the recent emphasis on exploring history of science in a global context, the conference will encourage research covering all parts of the world. The organisers plan to publish selected papers in an edited volume on the global history of science, technology, medicine, and indigenous knowledge. The conference will include keynotes from leading scholars as well as a programme of special public events in the evenings. Notable participants include Naomi Oreskes, Professor of the History of Science at Harvard University; Jane Lydon, Wesfarmers Chair in Australian History at the University of Western Australia; Peter Moore, author of Endeavour: The Ship and the Attitude that Changed the World (2018 book of the year by the Sunday Times); New Zealand filmmaker Lala Rolls, who will present her feature-length documentary film Tupaia’s Endeavour; Damon Salesa, Pro-Vice-Chancellor, Pacific at the University of Auckland; Matariki Williams, Curator Mātauranga Māori, Museum of New Zealand Te Papa Tongarewa; and critic and former Poet Laureate of New Zealand, Ian Wedde. This gathering will be held in Blenheim, a small city with a rich cultural heritage and which is surrounded by vineyards and stunning scenery. It will be distinguished by the integral role of local iwi (tribal communities), and participants will have the opportunity to learn about and engage with the knowledge traditions and historical experiences of the tangata whenua (people of the land). This is particularly important as the conference will be a forum for a range of vantage points on how knowledge is created and shared and it will enable genuine and critical reflection on the often painful and contested legacy of Cook’s voyages and the histories of empire and colonization that followed. The deadline for proposals is 8 May. The New Zealand History Research Trust recently announced winners of its annual awards. One of the successful applicants is Centre member Dr. Rosi Crane, who has been awarded funding to write a history of Otago Museum, which was founded in 1868. You can listen to her talking about the project with Lynn Freeman on Radio New Zealand’s Standing Room Only. As part of the University of Otago’s commemoration activities, the Centre for Research on Colonial Culture (CRoCC) and the Australasian Victorian Studies Association (AVSA) are co-hosting a conference and heritage festival on ‘1869’ from 25-29 September 2019. A call for papers is below. The closing date for abstracts is 1 April 2019. 1869 was a year in which many scientific, political, commercial, cultural and medical milestones were also recorded, including the first issue of Nature, the opening of the Suez Canal, the publication of the Periodic Table, Paul Langerhans’ discovery of pancreatic islets and the appearance of The Subjection of Women by John Stuart Mill. The organisers welcome abstracts, panel proposals and posters from all disciplines and perspectives, and particularly encourage postgraduate participation. Lisa Chatfield, producer of the BBC mini-series The Luminaries and its set decorator, Daniel Birt. The conference will combine a traditional academic programme with a range of public heritage festival events, special forums and social engagements. Please circulate the CFP widely and to your research networks. Just a reminder that the launch of Past Caring? Women, Work and Emotion (Otago University Press) will take place on Thursday, 21 February. Please join us at UBS from 5.30 to the celebrate the publication of this collection edited by three Centre members: Barbara Brookes, Jane McCabe and Angela Wanhalla. For an insight into what the book is about read this ODT article, Looking out for each other, featuring an interview with Barbara. There is an exciting opportunity for someone to do a PhD on “Māori Literature and the news”, as part of a Marsden project headed by Associate Professor Jacob Edmund (English and Linguistics, University of Otago). A Masters or BA(Hons) in Māori Studies, English, History, Media Studies or a related field would be preferred. See: PhD scholarship in Māori literature and the news for details. Please circulate this on your own networks, or forward to anyone you think might be interested. 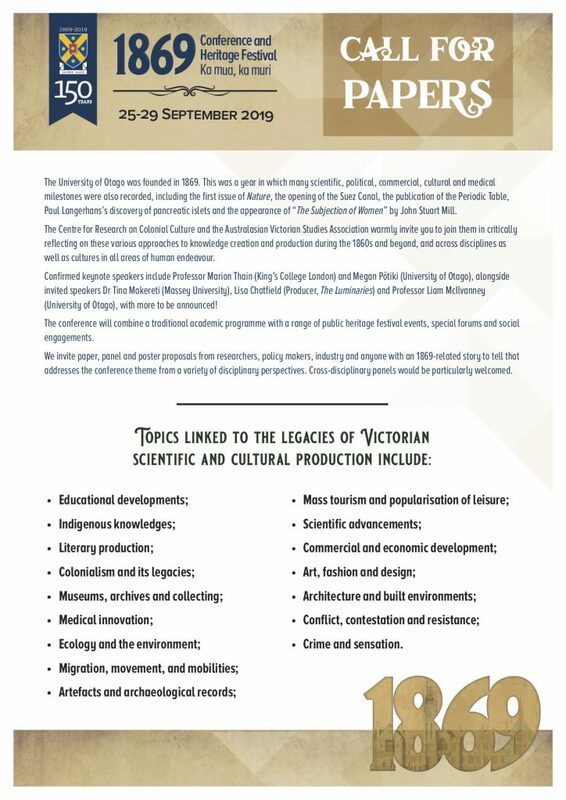 We are really excited to be co-sponsoring this conference with the Australasian Victorian Studies Association in late September. Please feel free to circulate this CFP and please consider submitting an abstract! Please come along to UBS on Thursday 21 February to celebrate the launch of Past Caring? Women, Work and Emotion co-edited by CRoCC members Barbara Brookes, Jane McCabe and Angela Wanhalla and published by Otago University Press. All are welcome, but please RSVP for this event (address is provided below). Annabel Cooper at the launch of her book, Filming the Colonial Past, in November last year. Congratulations to CROCC member Annabel Cooper. 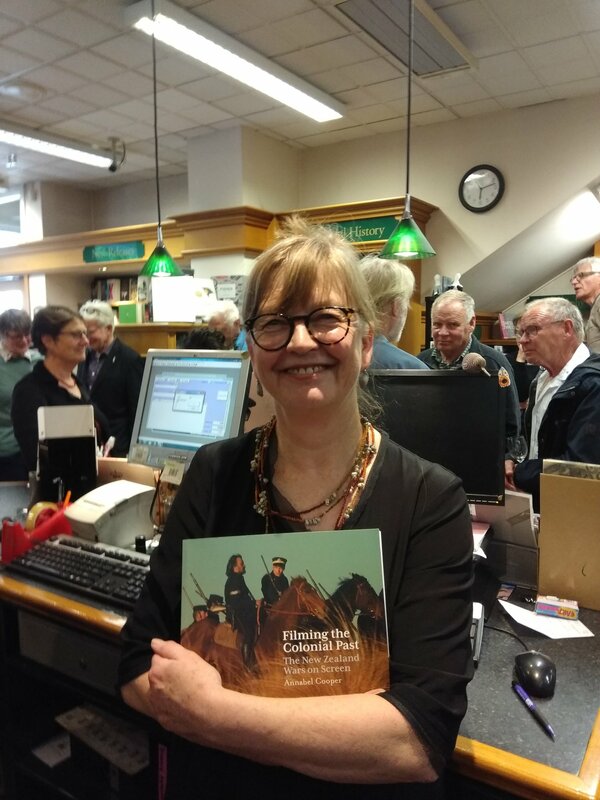 Her book, Filming the Colonial Past: The New Zealand Wars on Screen (Otago University Press), has been placed on the long list for the 2019 Ockham Book Awards, New Zealand’s foremost book awards. Click here for more information on this outstanding book.